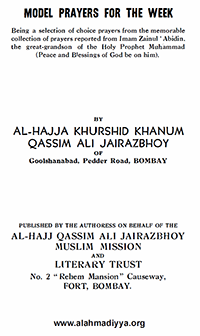 A selection of choice prayers from the memorable collection of prayers reported from Imam Zainul ‘Abidin, the great-grandson of the Holy Prophet Muhammad (Peace and Blessings of God be on him) by Al-Hajja Khurshid Khanum Qassim Ali Jairazbhoy of Goolshanabad, Pedder Road, Bombay. Published by the Authoress on behalf of the: Al-Hajj Qassim Ali Jairazbhoy Muslim Mission and Literary Trust, No. 2 “Rehem Mansion” Causeway, Fort, Bombay.